In Okinawa, one can find a seemingly boundless variety of dishes based on the culinary traditions of the islands and now heavily influenced by American tastes. Okinawan dishes typically use lots of vegetables, so they’re a wonderful option for healthy eating. ① Mince the garlic and onion. Cut the tomatoes for both the taco meat and toppings into １㎝ (little less than 1/4in.) cubes. Slice the lettuce into １cm strips. ② Add the olive oil and garlic to a frying pan and keep on low heat until you notice their aromas. Add the cayenne pepper and onions, raise to medium heat, and fry until the onions soften. Add the ground meat and fry until you get a crumbly texture. Now add the tomato and seasonings for the taco meat, and continue cooking until all the flavors mix well. 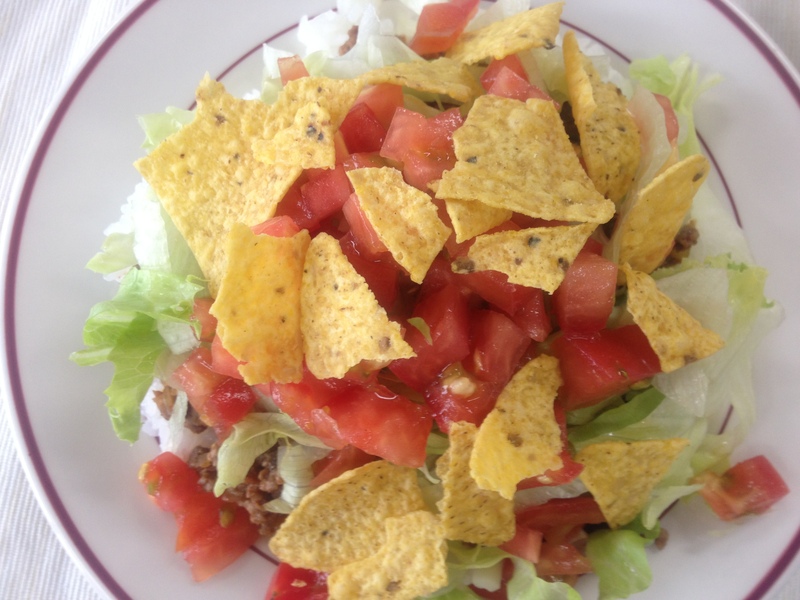 ③ Create a bed of rice on a plate, then add some shredded cheese, taco meat, lettuce, and tomato. Top with crumbled tortilla chips.